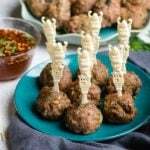 Thai Chicken Meatballs are great for an party appetizer, as an addition to rice noodle pasta or in sandwiches. 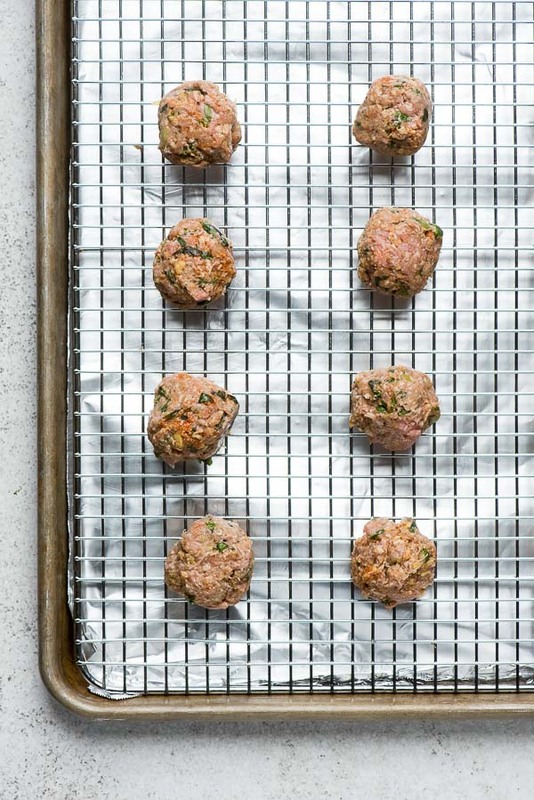 The prep time may be reduced by using a mini chopper which doesn't need to be rinsed between ingredients since they will all be mixed together in the meatballs! Maybe be made gluten-free as directed or with gluten bread crumbs depending on your needs. Preheat oven to 400 degrees. Fit a large (17 inch by 13-inch) rimmed baking sheet with foil (dull side up) and a cooling rack sprayed with non-stick spray. Note: recipe may be adapted to use a smaller baking sheet/rack combination. In a large bowl combine all ingredients. Work together with hands until all ingredients are incorporated (be sure to wash hands afterwards). Scoop heaping tablespoon and roll between the palms of your hands into balls. Place on the prepared rack leaving space between all the meatballs. Cook for 20-25 minutes, until the internal temperature of the meatballs registers 165 degrees with an instant read thermometer. Allow to rest for a few minutes before serving.